It’s a function of my job, but I’m fascinated by the logistics of beer: How it’s brewed, how it’s stored, the machinations of America’s clunky three-tier alcohol-distribution system. Often, those logistics are complicated, involving a highly regulated, taxed substance crossing interstate lines. And then some days, a truck full of beer gets stuck under a bridge in Milwaukee. It’s fun and unfortunate and also tangentially related to my curiosity about overturned trucks. Let’s learn more! These photos from the Milwaukee Journal Sentinel provide a riveting play-by-play of the incident, which occurred on January 15. 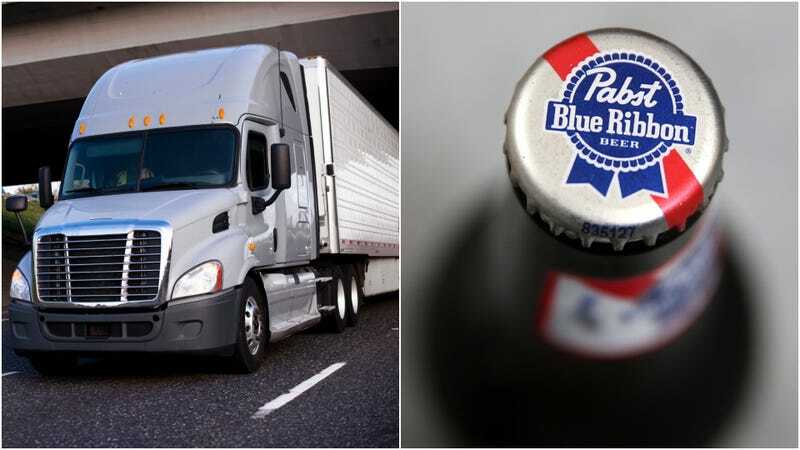 The driver of a semitrailer carrying palettes of Pabst Blue Ribbon en route to Miller Brewery reportedly decided to exit I-94 via a different ramp than planned, as the original ramp was closed. Ramp plan B proved to be the wrong route when Mitchell Boulevard exit took him under a bridge whose clearance was less than the truck’s height. Ergo, stuck truck, hipster disaster. Most importantly, no injuries were reported and no beer was damaged. Praise Ninkasi. The sight of the damaged truck, crumpled near its center like an accordion, would surely send a shiver down any trucker’s spine. But the driver was safe, as were the cases of beer that remained neatly stacked in the back of the vehicle. Click through the Journal Sentinel’s gallery, and stay tuned for our next installment of This Month In Overturned Trucks.